Every year it takes about 500 volunteers to accomplish our mission. With the tireless and generous contributions of our drivers, servers, board members and office volunteers Meals on Wheels is able to deliver over 122,000 meals annually to over 1600 clients. The Annual Volunteer Appreciation Reception is just one of the ways that we recognize and show our volunteers how much we value them. The Meals on Wheels service simply would not exist without them. They ask for so little in return for their dedication and this special evening is a fun opportunity to celebrate the good work our volunteers are doing in the community. Our volunteers are recognized for hours and years of service and we are proud to say that many have been delivering meals for well over 25 years! Sponsoring this annual event, which take place in April, allows your company, organization or group to show how much you value community engagement and good citizenship. We’d love to have you join us on this special evening and honour you for sponsoring this recognition of our volunteers! “If anyone has doubts about volunteering, just get them out on a route and see how rewarding it can be. 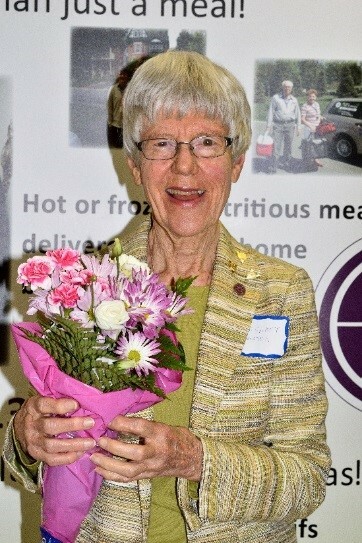 There have been days when I’ve pushed myself out the door feeling a bit out of sorts but returned feeling on top of the world — It’s the best possible tonic to start the week.” – Margaret Baxter, Meals on Wheels volunteer for 37 years and counting! In addition to acknowledging the good work of our volunteers, your company or group will also benefit from the following during the sponsorship year. Your business card or a listing of all sponsors will be displayed at each table at the event. Your company or group will be recognized in our AGM report. Your company logo or group name will be included on the invitation which goes out to approximately 500 volunteers. A representative from your organization or group will be invited to participate in the event by speaking at the event, receiving a table for 6, and displaying signage.